Filming bowhunts has become tremendously popular over the past decade. The video fire that was begun decades ago has continued to burn stronger with each passing year. This fall thousands of gun hunters and bowhunters will take to the woods armed with not just their weapon of choice, but also with an arsenal of camera equipment. With the growing interest in filming our hunting adventures the amount, and quality, of video accessories available to today’s hunter has greatly increased. Aside from the camera itself the second most important piece of equipment you can take with you is a camera arm. Which Camera Arm Works for You? The first thing you need to determine when selecting a camera arm is how you will be using it. The type and size arm needed by professional cameramen is a far cry from the camera arm needed to support a small camcorder to film your own hunts. A good camera arm is one that you feel comfortable and confident in using. There are several camera mounting systems available today and they are all of great quality, but personal preference plays a major factor in the purchase of a camera arm. Many hunters prefer one of the compact, light weight models that they can easily pack in and out of the woods and can set up quickly and quietly. However, some hunters and outdoor videographers prefer the heavier duty models that can support larger camera gear and reach nearly 360 degrees around their tree of choice. The majority of hunters taking the wood with a video camera in tow are filming their own hunts. For these hunters, the Pro Bow Cam from Pine Ridge Archery is the perfect choice. The Pro Bow Cam has a removable base which allows for quick and easy attachment to your tree of choice, pans 360 degrees and comes fully equipped with a pan/tilt head. This light weight camera arm is easy to pack into your treestand, easy to set up, and offers today’s hunter an affordable way to capture great footage of their hunting adventures. The folks at 3rd Arm have been building innovative, quality camera tree arms since 2007. They offer several varieties of camera arms that vary in size and are suited for various types of hunting requirements. All of 3rd Arms’ camera arms offer quick setup, easy leveling systems and stable support. When buying a 3rd Arm camera mounting system, you can bet you’ll be prepared to capture professional looking video. The 3rd Arm’s most professional camera mounting system and is used by pros all over the world. The Pro Series is made of aircraft grade aluminum and supports cameras weighing up to 12 pounds while weighing only 6.5 pounds. The 3rd Arm Pro Series comes provided with a built-in hook and string loop to make mounting the system to the tree safe and easy. By hanging the base on the tree this allows both hands to be free for installation with the included ratchet strap. Equipped with self-lubricating composite bushings at all friction points, the Pro Series remains quiet in the tree and the curved radius arm allows you film 360 degrees around the tree. Similar to the Pro Series in nearly every possible way, the Pro Series Extreme is built for the larger, heavier camera models available today. With the same concepts in design as the Pro Series, the Extreme features a larger curved swing arm for additional reach and the ability to support larger camera. The 3rd Arm Pro Series Extreme weighs 8.5 pounds and can support cameras up to 18 pounds. The compact Adventure Series is equally impressive at capturing professional grade footage, but comes in a 30% smaller unit which makes this camera arm a great option for hunters who want to film their own hunts. The unit only weighs 5 pounds and is strong enough to support cameras that weigh up to 7 pounds making it suitable for all hunting and filming styles. The Adventure series is a camera arm that is built to please. The 3rd Arm’s most affordable and versatile tree arm available, the Outback Series camera arm weighs only 3 pounds and supports camera models weighing up to 6 pounds. This makes the Outback Series the ideal camera arm for those who are just beginning to film their gu or bowhunts, or those filming with smaller cameras. The optional Stand Mount Base can be mounted to a flat, metal style climbing stand or any tripod and comes equipped with a German style fluid head making them extremely versatile. The 3rd Arm Bandit Series is the perfect arm for hunters who are looking to run a second camera in the tree to capture that unique second angle when filming. When folded up the Mini is only 12 inches long, but fully extends to 32 inches when assembled to the tree. This little tree arm literally adds a whole new dimension when filming your hunts. Muddy Outdoors features three camera arms that are portable, strong and offer rock solid support for your camera. 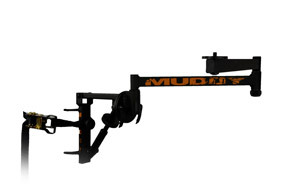 The price range on Muddy Outdoors camera arms ranges from $200 to $550. Regardless of which camera arm meets your needs, you know you are going to get a quality camera arm when you go Muddy. The smallest tree arm in the Muddy line is light weight and easy to pack. The Outfitter tree arm weighs just 4.75 pounds and features a string loop for easy hanging while attaching to the tree. Equipped with a dual leveling system that allows full range of motion when filming, the Outfitter features silent operation to keep you stealthy in the treestand. The easy to read bubble leveling system makes sure you capture the most level, solid footage possible. Similar in build and function to the Outfitter, the Hunter tree arm is slightly larger in size which allows it to support additional weight. This is a great option for cameramen who need to support more than 7 pounds of gear without wanting to carry a larger, professional caliber arm. The Hunter tree arm weighs in at 7 pounds which makes it easy to pack in and out of the woods. If you are looking for a professional grade camera arm, then the Boss Hawg is for you. Featuring silent armour paint to remain virtually silent in the tree, the Boss Hawg fully supports your camera to capture the best footage possible. Sporting vertically and horizontally leveling systems, the Boss Hawg is lightweight despite its large frame and is suited for the larger camera models used today. The Boss Hawg camera arm weighs 9 pounds and can support heavy professional-grade camera gear while offering rock solid stability. Lone Wolf is best known for their light weight, quiet and rock solid tree stands. Much like their stands their Strong Arm camera arm is also light weight and rock solid. Weighing only 3 ½ pounds, the Strong Arm camera arm packs and transports easily, however, when it is time to strap to the tree, this arm can help capture some serious footage. Featuring a universal mount for still and video cameras and capable of fitting trees as large in 22” in diameter, the Strong Arm may help you capture footage of your big buck kill this fall. Featuring the Manfrotto 3130 Pan and Tilt fluid head, the HunterCam Tree Arm Pro allows you to film that shooter buck with ease and stability while capturing professional quality video. The custom ratchet straps, the rapid ratchet and release system, used for mounting the HunterCam Cradle Pro make mounting and dismounting the unit easy, quiet and more importantly safe. The rapid ratchet and release system feature a nylon strap that is permanently stitched to the ratchet buckle and a rubber coated flat hook on the other end of the strap to make assembling the unit in the tree a breeze. Easily accessible features, strong design and fluid filming motion make the HunterCam Cradle Pro a great choice when looking to film professional quality footage. The HunterCam Cradle has been around since 1998 and has been constantly evolving and bettering itself ever since. Built for smaller camera models weighing three pounds or less, the HunterCam Cradle is perfect for hunters who just want to video their hunts to share with friends and family. Extremely versatile, this camera mounting system can be used for hunting, fishing or for use with spotting scopes. The HunterCam Cradle’s big brother, the HunterCam Cradle HD was built with the same principles and design as the HunterCam Cradle. Constructed with heavy duty anodized aluminum, this camera arm is strong and stable. Versatile enough to be strapped to the tree or mounted to a climbing stand or ladder stand. Small and compact enough to fit in today’s hunting packs, the HunterCam can be toted anywhere in the field. The smallest in the HunterCam camera mounting system line, the HunterCam Cradle Mini is the perfect camera arm for hunting over food plots or areas with big shooting lanes. Its super small, compact design doesn’t allow for extreme maneuverability, but what it lacks it range, it makes up for in versatility. Capable of being mounted to nearly any fixed object, the Mini can be used for video or still photography. When determining what camera arm will best suit your needs, there are several things to consider. You need to first think about your budget, don’t spend any more money you can afford on a camera arm. Next take into consideration what will best fit your camera. It isn’t necessary to have one of the heavier duty models for a smaller camera model; however your camera could be in danger if you don’t purchase an arm strong enough to support its weight. Once you have determined your camera arm you’re ready to film quality hunting videos!